During one of the first experiments I turned on the tablet and the screen came up looking broken. I attributed that to a bad connection somewhere, jiggled things around, rebooted and it worked fine afterwords. 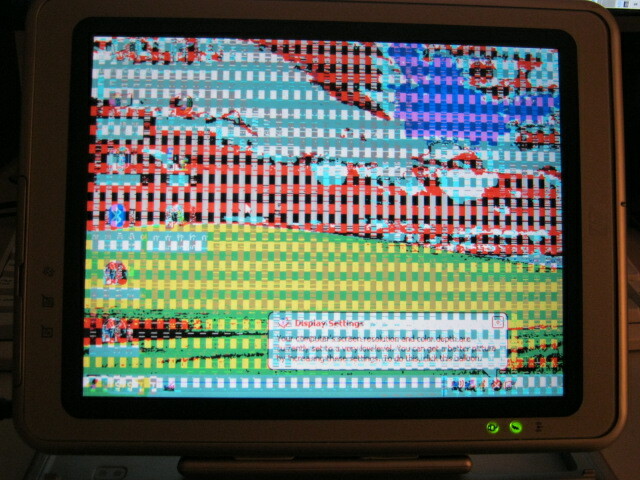 It seems everything still works except something’s wrong with the display hardware, showing those rectangles everywhere. I took the whole thing apart (which was a challenge because it had special HP pentagon screws) and removed/reattached all the ribbons many times, nothing helped. 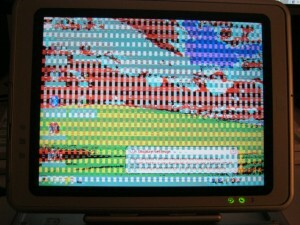 That windows refuses to switch to higher than 640×480 tells me the problem is probably in the video card, not the connection to the display. I really didn’t want to think this. 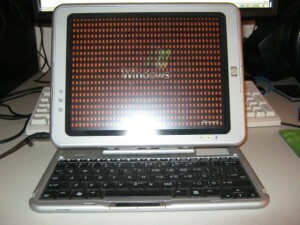 It took much time and energy and a sizable investment to procure this device – I was not willing to duplicate all that. A solution needed to be found, and fast… see next post.